Wash rice and soak in water for 10-15 mins and keep aside. Clean, wash thotakura and chop into small pieces & keep them aside. Heat oil in a pan add whole garam masala and stir, then add curry leaves. Add onion, green chillies and fry until the onions are soft. Now add ginger garlic paste, chopped vegetables and saute for a couple of mins. Next add chopped thotakura & mix thoroughly. Keep frying the whole thing over medium flame, finally add soaked rice, salt & mix it well. Then transfer the whole mixture to rice cooker and add 2 cups of water and cook. When done remove the lid and add lemon juice, coriander leaves and mix well. 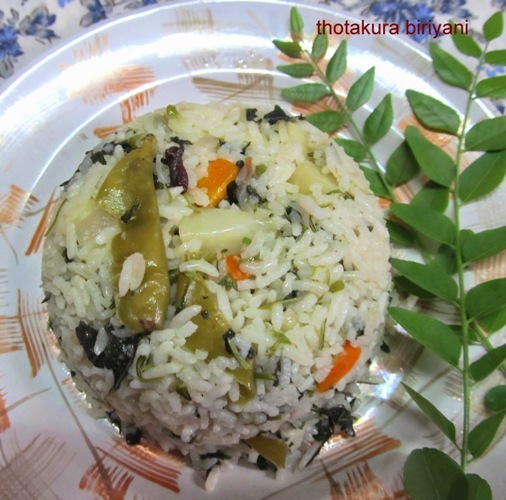 Now thotakura/amaranth leaves pulav is ready to serve, serve hot with raita.